Combine Peru's stunning highlights with trekking the Inca Trail to Machu Picchu, continuing into the Amazon. Journey to the mysterious Nazca Lines, to the 'White City' of Arequipa, see the impressive Colca Canyon and spend a night on Taquile Island before reaching colonial Cusco. Arrive to Lima and check-in at hotel. Afternoon tour of Lima. Lima, Peru's capital, was founded in 1535 AD by the Spanish conquistador Francisco Pizarro. It was built on the Pacific coast, by the Rimac River and close to the natural harbour of Callao, on land that had already been inhabited for thousands of years. Today Lima is a modern city, but there are obvious reminders of its ancient and colonial past. It is also gaining a reputation as a culinary centre. Heading south on the Panamerican Highway we stop at the ancient religious centre of Pachacamac, whose many pre-Inca and Incan adobe walls and temples have miraculously stood for hundreds of years, preserved by the desert climate. We continue on to Paracas and its national park where we can observe some extraordinary lunar landscapes and have the chance to see varied birdlife. There is the possibility this morning to take an optional excursion to the Ballestas Islands to see a large colony of sea lions, seabirds and even penguins. We then continue south pausing at Ica to visit the small but excellent museum (optional) or the huge sand dunes outside the town at Huacachina Oasis. Then we drive to the mysterious Nazca Lines. Some specialists have speculated that they represent the world's largest astrological calendar. Huge birds, spiders, whales, other creatures and geometrical figures are represented in outline. Here we'll climb the nearby viewing platform for views out over the lines etched into the desert. There should also be time for optional visits to the nearby Antonini Archaeological Museum, the Chauchilla pre-Inca cemetry or the Nazca aqueduct. Following the coastal route through the desert we reach the settlement of Puerto Chala. In Inca times relays of chasquis (runners) transported fresh fish 250km to Cusco in the mountains in just one day from nearby. Depending on timing we will visit Quebrada de la Vaca Inca ruins either en route or tomorrow morning. These remains are thought to be part of an original Inca Trail to Cusco, and include ancient llama corrals and grain stores. A full day's drive takes us through strange desert scenery. As we leave the coastal plain behind, our road climbs steadily through the Andean mountains to reach the beautiful city of Arequipa. This morning we explore this beautiful city, situated at 2380m and surrounded by snowcapped mountains including the perfect conical peak of El Misti (5822m). Arequipa is famed for it's colonial architecture and the arcaded city square, dominated on one side by the twin towered cathedral (1612), is among the finest to be found in South America. Our morning walking tour includes Santa Catalina Convent, a miniature walled town which once housed 450 nuns and serving ladies in total seclusion. The afternoon is free to further explore this fascinating city, starting in the Plaza de Armas you could visit the La Catherda or the archaeology museum and wander through the colonial districts. Heading north from Arequipa we enter the world of the Altiplano. We pass behind the volcanoes that ring Arequipa and on to Chivay. Passing herds of Llama and Alpaca - if lucky we may spot the elusive Vicuña. Today we briefly reach the highest point of our trip at 4,800m before descending towards Colca. From Chivay we make an early start to the mirador Cruz del Condor, overlooking the magnificent Colca Canyon, in the hope of spotting the rare Andean Condor. Seeing these magnificent birds in flight is a highlight of any trip. From here we make a short walk to Cruz del Cura before continuing to Puno on the shores of Lake Titicaca: the highest navigable lake in the world at an elevation of 3,856m, and the legendary birthplace of the Inca civilisation. The local Aymara and Quechua-speaking indigenous people have adapted over generations to life at altitude and have larger lungs, hearts and spleens, and blood that is particularly rich in red corpuscles. The Uros people dwell on the lake itself, on floating islands of totora, a reedlike papyrus that grows in the shallows and is used in the construction of houses and boats. We continue by motorboat to Taquile Island which has preserved much of its Inca and pre-Inca heritage and the islanders still speak the language of the Inca-Quechua. Accommodation is limited to rustic, dormstyle facilities in a local house. In the late afternoon we walk to the top of this terraced island to watch the sun set. Todays one kilometer walk is expected to take around one hour with 200m of ascent. This morning we walk across the island for the views. On Taquile Island the local people still preserve a rich tradition of music and dance. This is the ideal opportunity to buy locally produced knitted goods - produced by the men of the island. In the afternoon we walk back to the harbour to return to Puno by boat. 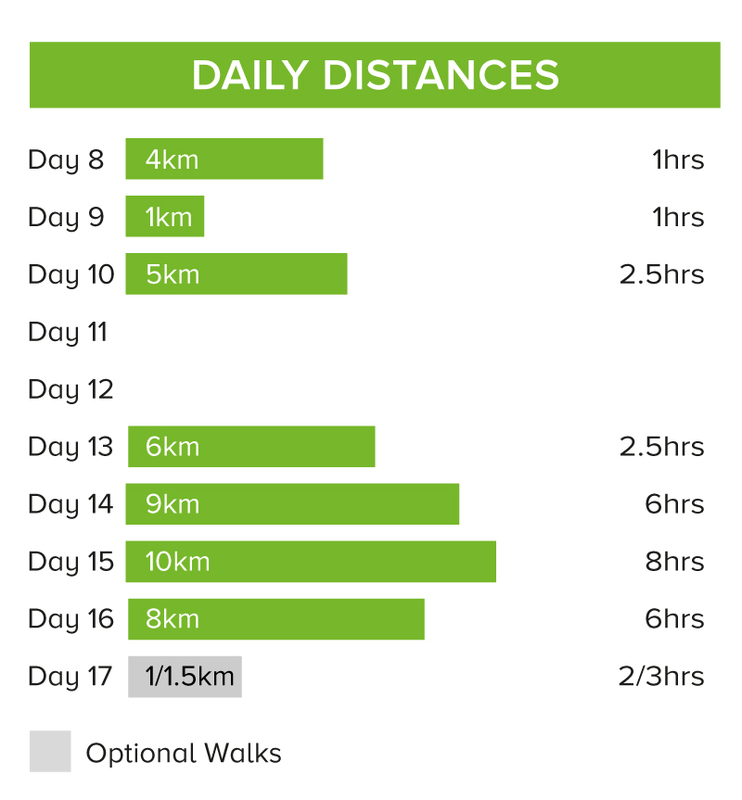 Todays five kilometer walk is expected to take around two and half hours. Today we follow the legendary route taken by the first Inca ruler - Manco Capac - on his way to Cusco. En route we stop at the beautifully scenic site of Sillustani - where the chullpas (funeral towers) are thought to date from the 14th century. Driving up to the northern limit of the Altiplano we cross La Raya pass (4335m) and descend towards Cusco, and then continue on to Ollanta in the Sacred Valley. The mountain scenery is desolate but magnificent and we may spot flocks of llamas and alpacas grazing on the windswept pastures. Depending on time, those who wish may visit the colonial church at Andahuaylillas (45kilometres south of Cusco). Today is left free to explore the Sacred Valley and there are plenty of things to do. There is the opportunity to go whitewater rafting on the Urubamba River (grade 2-3, seasonal) - no previous experience is necessary and all safety equipment is provided. You can also choose to visit the market at Pisac and its incredible Inca ruins spread out amphitheatre fashion far above the town. This morning we drive to Ollantaytambo, an original Inca town. Here we have a short walking tour to stretch our legs, visiting a traditional house and our first view of Inca terracing. We continue by bus for another hour to reach KM82, the starting point for the classic Inca Trail. The trail was first explored by Hiram Bingham in 1911 and opened for walkers in 1970. The famous ruins of Machu Picchu are not the only historical remains within the area: many other interesting sites are hidden in places which can only be reached on foot, and have scarcely been explored. We meet our porters and support staff, beginning our trek after lunch. The route crosses the Urubamba river, following a wide dirt trail alongside the riverbank. The undulating path takes us into the Sacred Valley of the Incas to Llaqtapata (2,700m). Here we camp opposite the ruins of Llaqtapata, a spectacular spot with amazing night skies. Todays six kilometre walk is expected to take around two-and-a-half hours with an ascent of 100 metres. After a hearty breakfast we cross the river to visit the Llaqtapata Inca ruins before continuing with the trek. Today we follow the course of the Kusichaca river past small communities, crossing it to reach Wayllabamba, a quiet village of Inca origins and the last settlement on the route. After lunch we gradually ascend through the start of the cloud forest to Llulluchapampa (3,800m) which affords stunning views of the snowy peaks of Veronica (5,750m). Here we set up camp for the night; there is a well maintained toilet black at this site. Todays nine kilometre walk is expected to take around six hours with 1,080 metres ascent. Today is an earlier start as we trek over the Warmiwanusca (Dead Woman's) Pass to 4,200 metres. The two hour ascent is one of the more challenging sections of the trek, we take is slow and steady with many stops to admire the view and sunrise. After a rest and photo opportunity we descend along a stepped path to the valley of the Pacamayo river with its tropical vegetation. Here we break for brunch before beginning the ascent (mainly on steps) to the second pass of the day. We visit the ruins of Runkuraqay and then it's the final ascent to cross the Runkuraqay Pass (3,950m). After the pass it was a long gradual descent passing into the start of the main cloud forest to reach the bottom of the valley. The Sayacmarca ruins are visible on a rocky outcrop, they command an imposing view and have only one means of access, a narrow granite stairway. We cross the valley to reach the Sayacmarca campsite for a late lunch. From here the trail goes through cloud forest with vines, exotic flowers (among them orchids) and luxuriant trees, with views (if we are lucky) of the snowcapped peaks of Salkantay. We walk through an Inca tunnel and along a ridge above the Urubamba River to our campsite above the Phuyupatamarca ruins (3,579m). The campsite has amazing panoramic views of the surrounding peaks and down the valley towards Machu Picchu mountain. Todays 10 kilometre walk is expected to take around eight hours with 1,000 metres ascent and 630 metres descent. Today is our final day walking along the Inca Trail. We say thanks and goodbye to our porters and begin our trek into Machu Picchu. We pass the Puyupatamarca ruins and spend the majority of the morning going down following stone paths and stairways, 80% of which are original Inca architecture. Coming out of the cloud forest we are greeted by the spectacular views down the valley, walking through the impressive Inca terraces at Intipata we reach our lunch stop at Winay-Wayna (2,591m). Those who wish can visit the ruins here, this Inca site is built into the steep hillside and like Machu Picchu, was abandoned for unknown reasons. Winding our way along the edge of the mountain we follow a wide path adorned with wild flowers and orchids to we take the final steps up to reach Inti Punku - the Gate of the Sun. passing through there is a sudden and fantastic view of the Lost City itself, Machu Picchu, set in a grandiose landscape that amazes all spectators. We walk down through the site and then take the pubic bus down the mountainside to our hotel in the town of Aguas Calientes situated on the valley floor below Machu Picchu. Todays eight kilometre walk is expected to take around six hours with 1,000 metres descent. Day 17 - Revisit Machu Picchu. Return to Ollantaytambo by train. Our final morning is spent at Machu Picchu, probably the most astounding feat of engineering in all of ancient America. Temples, stairways, palaces and gabled stone dwellings are scattered everywhere, testifying to the energy and ingenuity of the builders. We have a guided tour with our Explore Leader then have some free time to explore the site further for as long as you wish before taking the bus back down to Aquas Calientes. It is also possible to climb the steep peaks of either Machu Picchu Mountain or Huayna Picchu Mountain to look down on the citadel. Machu Picchu Mountain is a 700m climb from the top of the citadel. There are cobbled stairs all the way up with a few eye-opening drops in some parts, and the round-trip takes about tow and half to three hours. Huayna Picchu Mountain is only 350m, half the size of Machu Picchu Mountain, but much steeper. There are many more sheer drops, and it is definitely not suitable for someone with a fear of heights. For those who fancy doing the one hour climb, you'll be rewarded with world-beating views of Machu Picchu, and the feeling that you're standing on a precipice at the top of the world. These climbs must be pre-paid at time of booking. If you change your passport between your time of booking and prior to travel please take your original passport with you. Those doing one of the optional climbs will take the first bus back up the Machu Picchu to begin the climb at 7am after which you will meet up with the rest of the group to take the guided tour. In the afternoon we get the train to Ollantaytambo, located in the Sacred Valley of the Incas, and then return to the historic town of Cusco by bus. Depending on the time of the train, you may have a free afternoon in Aquas Calientes, where there are many restaurants and cafes and a large covered market. The old capital of the Inca Empire survives only in its ruins, imbued with an atmosphere of mystery and grandeur. The Spanish style city of today's Cusco, with its attractive pink tiled roofs, arcaded plazas and steep winding alleyways, stands upon tremendous Inca foundation stones. The interlocking stones, assembled so carefully that a knife blade cannot be forced between the multi-sided joints, were highly functional as well as beautiful - they are earthquake-proof! During our stay, we plan a walking tour of this lovely city to see important Inca and colonial monuments, such as the Inca wall of Hatunrumiyoc with its famous twelve-sided stone. The stone, measuring some 5 feet across, has the typical bevelled joints which create the patterns of light and shadow on Inca walls. We also visit Cusco's temple-citadel, Sacsayhuaman which broods high above the town, its huge, zigzagging stone walls broken into 66 sharply projecting angles to catch attackers in a withering crossfire - and walk back down to the city centre. The Inca Trail Trek part of this trip ends this morning. Those doing the Amazon extension transfer to Cusco airport for the short flight to Puerto Maldonado, which is located in the Southern Amazon area of Peru. (Your tour leader stays in Cusco). The Amazon Basin covers two fifths of South America and is shared between many countries including Bolivia, Brazil, Colombia, Guyana, Venezuela, Ecuador and Peru. Most of the area is covered by rainforest - the largest rainforest and the most bio-diverse environment in the world. Sixty percent of Peru lies within the Amazon Basin, the greatest area of Amazon Rainforest after Brazil. Yucay - (Non-trekkers) Rafting on the Urubamba River US$ 65 depending on numbers; Visit Misminay Village US$ 75 (based on 4 people). For your trek: In the highlands conditions can be dry and sunny during the day but bring warm clothing such as a warm fleece, thermal underwear, warm hat and gloves. These will be needed when the temperatures drop, especially at night when temperatures can drop dramatically. Lightweight waterproofs are also essential. You may also wish to bring your swimsuit. Thermals: Useful for walking when cold, around camp and much more practical (and warmer) to sleep in than pyjamas. Trainers or Trekking sandals: Useful around camp, in towns and when travelling. Waterproof sandals are ideal for rafting. Socks: Use good quality socks that you are used to walking in, plus liner socks if you are used to these. Waterproofs: Breathable waterproofs not only protect against rain and wind, but also stop you from overheating. Thick jumper/fleece jacket: A thick jumper or fleece jacket is necessary as nights can be very cold at altitude, especially in their winter months (June to September). Make sure that your waterproof jacket is loose enough to wear over your sweater or fleece. T-shirts: We recommend t-shirts made from wicking materials as these keep you drier and warmer. Shorts: Shorts can be comfortable to walk in but carry long trousers with you in case of strong sun or you feel cold. Remember we shall be passing through the occasional remote village and short shorts (especially on women) can give offence to the local inhabitants. Gloves and Hat: Essential around camp in the morning, and in the evening, at higher altitudes. Bring light clothing (cotton or wicking material) - Long sleeve shirts and long trousers are best when walking through jungle, and a light weight rainjacket. It is worth also bringing some warmer clothes, particularly between May and September, in case of cool weather. We recommend you bring well broken in and comfortable walking boots with ankle support. We do not recommend borrowing or renting boots. It is a good idea to carry your boots in your hand luggage on international flights or wear them - should your luggage be delayed, your boots are the one thing which will be irreplaceable. If you are rafting bring shoes that you don't mind getting wet. For your trek bring one main piece of baggage and a daypack. Your main bag should be lockable as this will be left in storage in Cusco whilst on the trek. Before leaving Cusco there is time to re-organise your luggage. Your trek luggage, including sleeping bag, should be packed into the kit bag to be carried by the porters. The weight limit for this is 7kg but you will probably find that you do not need this much. Advice on how to pack will be given at the trek briefing. During the course of a trekking day, you do not have access to the luggage, which is being carried for you by the porters. In any mountain region the weather can change rapidly and you must be equipped for this eventuality. Your daypack should be large enough to carry your day things including: waterproofs, sweater, long trousers (if walking in shorts), warm hat and gloves, sun hat, suncream, water bottle, tissues and your packed lunch. Camera equipment can be heavy so think carefully when deciding what to take. A rucksack with 20 or 25 litres capacity is usually sufficient. For your trek: Remember to bring: torch, water bottle, insect repellent, suncream (at least factor 30), lip salve, good quality sunglasses and sunhat. Please note Drones are prohibited in most tourist areas in Peru. You may also wish to bring binoculars and your own sleeping bag. Sleeping Bag: This may be down or synthetic, but should be 4-season. A cotton liner helps to keep your bag clean. You do not need a foam mat as thermarests are provided. It is possible to hire an appropriate down sleeping bag for the trek locally (US$ 20). Water Bottle: Water along the trail must never be considered as drinkable. The camp staff provide purified water each day with which to fill your bottle or camelback. Your bottle should hold at least two litre and be resuable as disposable plastic bottles are not allowed on the trail. Metal bottles can also double up as hot water bottles when hot water is available. Torch/Batteries/Bulb: A small torch is essential for finding things in your tent, visiting the 'toilet' in the night etc. Often a head torch is the most practical option as it allows you to have both hands free. Remember to bring spare batteries. Toiletries: Only bring essential toiletries such as toothbrush/paste, soap, toilet roll and a small towel. Wet wipes are great for a quick clean up in your tent. Personal First Aid Kit: On each trek a first aid kit is carried but you should have your own blister kit, supply of plasters, pain relief etc. for you own use. Cloth bags: Single use plastic bags are not allowed on the trail. Equipment Hire and Trek Training Days - Trek Hire UK hire out a wide range of kit including quality sleeping bags, down jackets and walking poles http://www.trekhireuk.com. They also run regular trek training and preparation days from their base in the Surrey Hills, ideal for getting an indication of your overall fitness level and also covering advice on kit and altitude. We avoid the crowds on our three night trek, and camp away from the main campsites. Two-man tents are provided with plenty of room for two people and bags. There is also a dining tent and a toilet tent. The trek is fully supported by our team of porters who set up and take down the tents, and prepare our meals. They also carry water and all bags except daysacks, under strict guidelines. A single tent is available on request prior to departure costing £40, please discuss with your sales consultant (limited availability). Day three you stay in a simple hotel with en-suite rooms and a small swimming pool. Day nine you stay in a simple village house, with dormitory accommodation and basic toilet facilities. Travellers with heart or lung conditions, anaemia, asthma, high blood pressure, or taking the contraceptive pill must seek the advice of their GP and specifically mention the maximum altitude the trip reaches (please refer to Tour Essentials box on front page of your Trip Notes). Please take the trip notes to your medical appointment so that your doctor has the full details of your trip. 1. In order to regulate the number of people walking on the Inca Trail it is necessary to buy an Inca Trail Pass specific to the days that you wish to travel. There are 200 passes per day for tourists, the remainder are for guides and porters. 2. If you are travelling on an Explore trip, Explore buy the necessary permit on your behalf. This is non-refundable and can't be refunded or transferred after you have confirmed your booking. 3. Passes sell out quickly, so we would urge that you book your tour well ahead of your intended travel date. New Inca Passes are released in early October of each year, so ideally we would recommend that you book your trip at least 6 months ahead and by December for the following year where possible. 4. Please note that due to the way the passes are distributed in October although a tour departure may be 'Guaranteed' we are unable to guarantee individual Inca Trail passes until we have confirmation that the passes have been purchased. On booking we will be able to tell you the date that your pass should be confirmed, and will contact you immediately in the (unusual) event that it is not. Because of this we would recommend that you either book your flights through Explore or ensure that your tickets are flexible / refundable. 5. In order to buy your pass we will need to take an additional £125 per person non refundable deposit and require your: name as per passport, passport number, date of birth and nationality. If you change passport before travelling it will be necessary to provide a copy of both passports in advance of travelling and to carry a copy of your previous passport with you. 6. 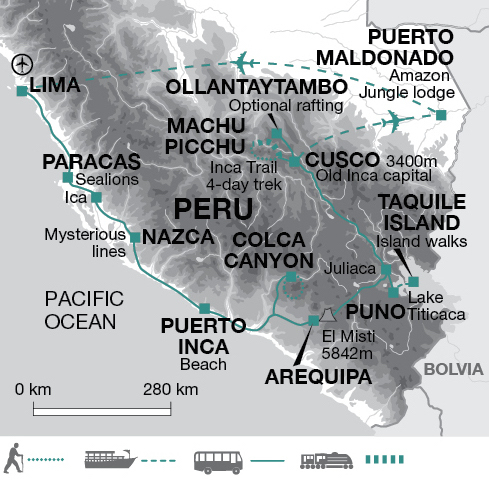 The Peruvian authorities may change the regulations for the Inca Trail Pass at any time. In the event of this we will inform you as soon as possible. Additional notes for trips that include the Inca Trail 1. In order to regulate the number of people walking on the Inca Trail it is necessary to buy an Inca Trail Pass specific to the days that you wish to travel. There are 200 passes per day for tourists, the remainder are for guides and porters. 2. If you are travelling on an Explore trip, Explore buy the necessary permit on your behalf. This is non-refundable and can't be refunded or transferred after you have confirmed your booking. 3. Passes sell out quickly, so we would urge that you book your tour well ahead of your intended travel date. New Inca Passes are released in early October of each year, so ideally we would recommend that you book your trip at least 6 months ahead and by December for the following year where possible. 4. Please note that due to the way the passes are distributed in October although a tour departure may be 'Guaranteed' we are unable to guarantee individual Inca Trail passes until we have confirmation that the passes have been purchased. On booking we will be able to tell you the date that your pass should be confirmed, and will contact you immediately in the (unusual) event that it is not. Because of this we would recommend that you either book your flights through Explore or ensure that your tickets are flexible / refundable. 5. In order to buy your pass we will need to take an additional £125 per person non refundable deposit and require your: name as per passport, passport number, date of birth and nationality. If you change passport before travelling it will be necessary to provide a copy of both passports in advance of travelling and to carry a copy of your previous passport with you. 6. 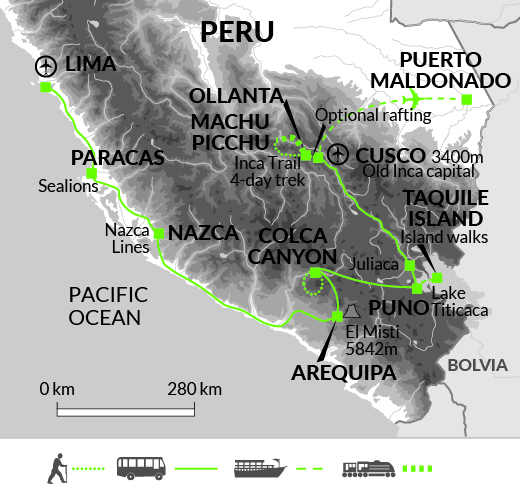 The Peruvian authorities may change the regulations for the Inca Trail Pass at any time. In the event of this we will inform you as soon as possible. 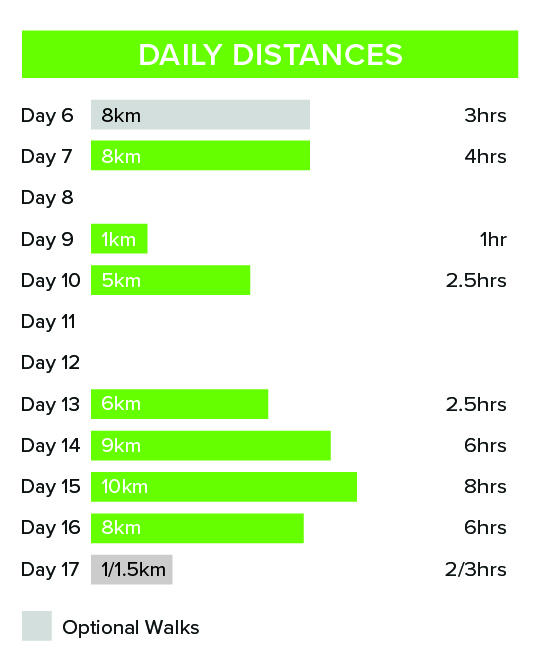 Walks on 7 days for between 1 to 8 hours. The Inca Trail section is 4 days trekking for between 2.5 to 8 hours, reaching a maximum altitude of 4,200m. Well-defined paths with original Inca steps. For the 2020 itinerary there is the addition of an extra day in Chivay with an optional afternoon walk and an included walk along the Colca Canyon. Read the blog by Customer Support Manager Becky Powney to find out. In order to regulate the number of people walking on the Inca Trail it is necessary to buy an Inca Trail trekking permit, these are included in our trips but can sell out quickly for certain months. Walking the Inca Trail to Machu Picchu is one of the best ways to discover the culture and history of Peru. Avoid the crowds our three night Inca Trail trek, designed so that we stay on quieter campsites. Spacious tents are provided and the trek is fully supported by our excellent cook and team of porters who set up and take down the tents, provide water and carry all bags except day-sacks. Our porters are from the local villages, so that the surrounding communities benefit from your visit, and we abide by the strict guidelines regulating both their working conditions and care of the Inca Trail. The Inca Trail is doable for anybody that leads a reasonably active life, you can take as long as you need and stop to take in all the marvellous views and Inca ruins along the route. Explore the rainforest from our eco lodge in the Peruvian Amazon and learn how the biodiversity of the area and the surrounding communities are being protected. Built within the Inkaterra Ecological Reserve, an area of virgin forest, the Inkaterra Field Station is ran by the Inkaterra Association, an NGO which is dedicated to supporting, fieldwork, biodiversity research and conservation.